Landscaping Secret! Get Rid of Weeds Fast! Need to get rid of weeds fast? Try this home made weed killer! Works like a charm every time and doesn’t contain any harsh chemicals! Put in 32 oz spray bottle. And shake well. Great for killing weeds! Safe to use around pets. Best to use on a hot sunny day. This solution is very effective! 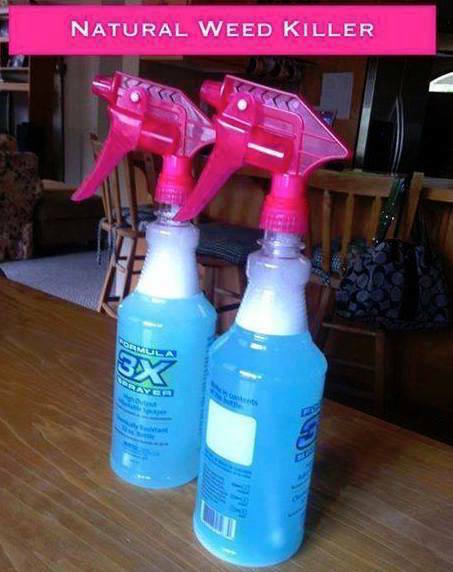 It will kill weeds an anything else you spray it on! So it is great for cracks in concrete, gravel, paths or anywhere else you don’t want weeds or anything else to grow. Do not spray on flowers or anything you don’t want to kill. Can you use this solution in a 2.75 gallon sprayer used for large areas? Will it kill moss? Need to remove moss and grass from driveway before paving driveway. Once you have killed the weeds in a yard, how long does it usually take before the area can be replanted, i.e. St. Augustine sod? Thanks. Does it kill crabgrass? Does at home surrounding grass? Just wondering if after the weeds have died can I place other plants in the soil or is it contaminated for good? Thank you. WILL IT KILL YOUR SHRUB IF YOU GET IT ON THEM? is it safe for pets to around? Will this work on Poke weed? About Poke Weed. We had a horrible problem with that terrible weed. We tried everything and finally had to buy a spectracide weed killer made especially for poke weed. So many regular weed killers do not work. My one piece of advice is to do what the spectracide instructions said to do for poke weed. Cut the stem of the poke weed and spray your solution directly into the stem so the stem carries the solution to the root type tuber that supplies that weed. If you don’t get that tuber, the weed will multiply and return worse than ever. Our poke weeds had reached the height of 5 or more feet tall and cutting that stem to about a foot and spraying into the stem worked. It took about a week for it to completely die. Be careful while around that weed. Keep your skin protected. I just touched my husband’s yard clothes and it caused an allergic reaction to my skin and eyes that required a shot and medication. Just a great way to get rid of dandelions. It doubles thistle in 3 weeks. Kills it in minutes but when it regenerates, look out! This work great for killing weeds, grass and around patio stones etc. Would this work on poison ivy or poison oak? What can I use on my lawn to kill the weeds and keep green grass? No it will kill your grass. Use it where you don’t want anything to grow. To kill weeds but not grass use Scott’s Weed and Feed. Good recipe, will have to try on my patio.